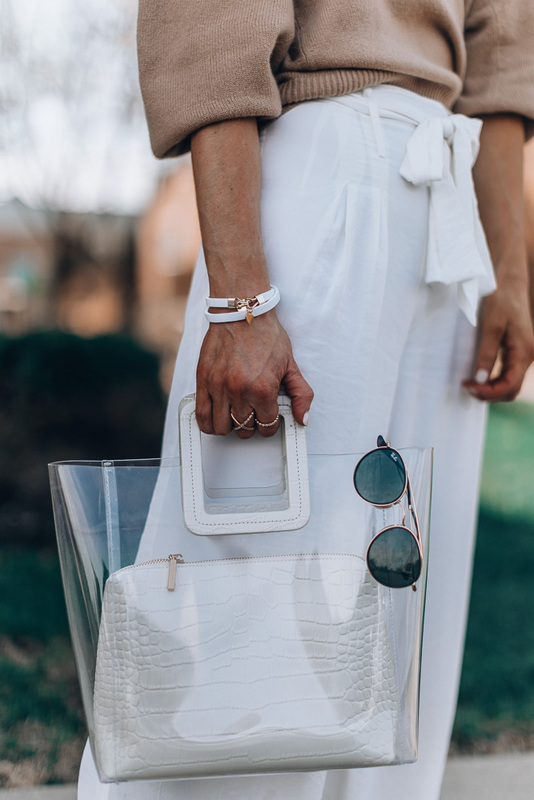 White accessories can feel intimidating to wear, especially with two little ones running around, but it’s definitely the best color match for beige. Something as simple as a leather wrap bracelet and white handbag can prevent you from blending into the background. When it comes to accessories, I’m constantly returning to Victoria Emerson for chic, everyday bracelets. The white leather wrap one featured today has been a favorite this season because it’s minimal yet versatile. You can wear it alone or layer it up with a watch and other bracelets (I also love this one here). It really adds the perfect finishing touch to a simple outfit. Adding textures to a beige outfit can make it feel more elevated. Some of my favorite ways to achieve this are through animal prints and textures and embellished accessories (like these pearl sandals I can’t stop wearing). Victoria Emerson’s animal print bracelets (here and here) would make such a fun addition to a neutral look. I don’t get too crazy with jewelry, but I do love the look of beige with dainty gold pieces. I opted for some of my favorite rings, but even a few simple necklaces offer a subtle sparkle that pops against beige. You can stack varying lengths to make a cool statement. Are you guys on the beige trend? Drop your favorite styling tips below! Thanks to Victoria Emerson for sponsoring this post!